I buy whole pork loins for my back (Canadian) bacon, loin hams and to cut into pork chops and roasts. I had a small piece of one left in the freezer with a nice fat piece and I decided it would be perfect for Pork & Roast Potatoes. 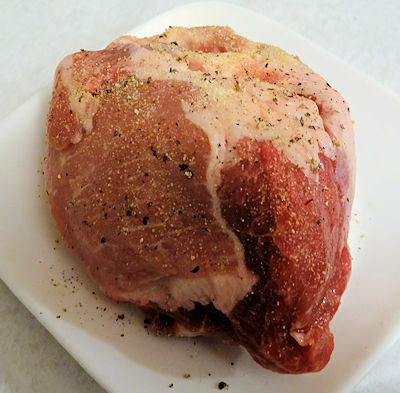 I sprinkled salt, pepper, garlic powder and onion powder on the pork. I cut each potato into six wedges. Then I tossed them with oil and herbs de provence. I put the potatoes in a roasting pan and made sure to drizzle any excess oil from tossing them over the potatoes. I put a rack on top of the potatoes and the roast on top of the rack. I put the roast and potatoes in a preheated 400 F oven. Every 20 minutes, I took the pan out of the oven, put the roast on a plate, turned the potatoes, put the roast back over the potatoes and put it back in the oven. 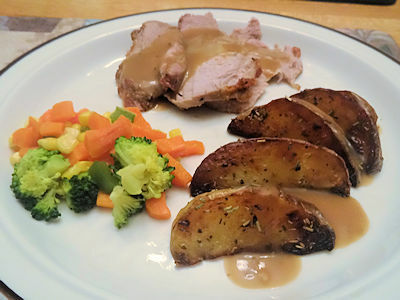 After 1 hour and twenty minutes the pork’s internal temperature was 168 F. I like my roast pork at 165 F. I put the roast on the cutting board to rest and put the potatoes in a bowl and kept them warm. I made the gravy while the roast was resting. I melted butter in the roasting pan. When it was melted, I added the flour and stirred to mix. I added the stocks and soy sauce. I heated and stirred until thickened and simmered for a few more minutes. I carved the roast and served. We served the meal with steamed mixed vegetables. This was a nice moist piece of pork. What little fat came off it dripped over the potatoes and added to the flavour. The potatoes were crispy with a creamy centre and a nice herb touch. The gravy was rich and smooth. A classy meal if I do say so myself. 2 medium soft skinned potatoes, cut into six wedges each. Sprinkle the salt, pepper, garlic and onion powder over the roast. Toss the potatoes with the oil and herbs de provence. 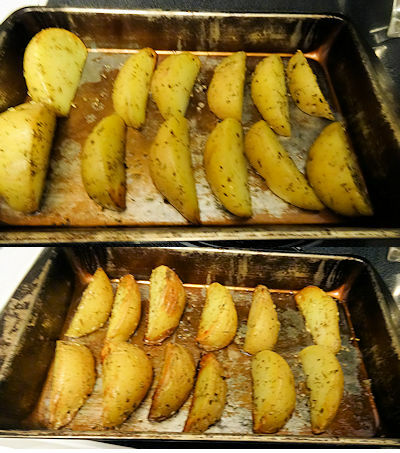 Put the potato wedges in a roasting pan making sure to drizzle any excess oil over the potatoes. Put a rack over the potatoes and put the roast on the rack. Bake in in a preheated 400 F oven for 1 hour 20 minutes, turning the potatoes every 20 minutes. Make sure the internal temperature of the pork is over 165 F.
Let the roast rest on the cutting board. Put the potatoes in a serving dish and keep warm. Melt the butter in the roasting pan. Mix the flour with the butter until mixed. Add the beef and chicken stock and soy sauce. Heat stirring until thickened. Simmer for a few more minutes. 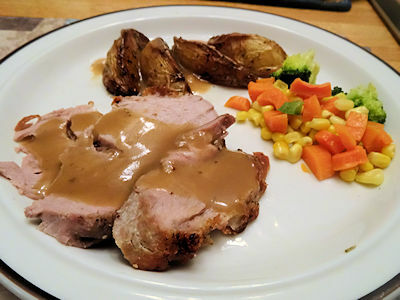 Carve the pork and serve with the potatoes and gravy. I love how effortless you make making dinner feel. This recipe is so simple and looks soooo good! Thank you, that is very kind. I just have fun and cook what I like with a love of experimenting to find more I like! 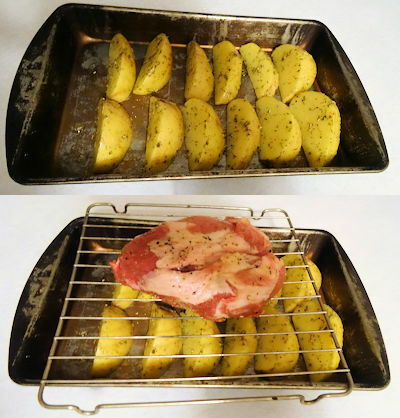 I love that you cooked the pork over the potatoes, what a great idea! It looks lovely as always! Har! I don’t know, I was kind of preferring your pork roast with rosemary.